Looking at the 1000DS, it is quite easy to trace its heritage right back, through the obvious SuperSport range of the late nineties and early noughties, back through the lost years of the early nineties when Ducati really weren't all they could have been and all the way back to the mid eighties when the Pantah broke new ground by being a Ducati sportsbike that was both mechanically quite up to date and electrically quite robust. Belt driven cams, oil level sight glasses and electronic ignition may all be pretty much the norm now, but back in 1984 they were a revelation. And yet I feel that there is a deeper, more spiritual relationship to the older bevel drive bikes. The original 900SS, it's racing predecessor the 750SS and the celebration Mike Hailwood Replica. Don't get me wrong, though. Although I had a 900SS and a Hailwood Rep, I see no similarity at all between those bikes, which I loved very much but which were, in all honesty, prehistoric, and this latest in the line. What there is, though, is a common feel. Perhaps I should explain. 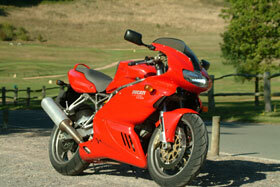 I raced bevel drive Ducatis in the eighties, and the racebikes were derived from the 900SS road bikes. But obviously they were streets apart in reality. The roadbikes were from an era where good suspension simply meant that there was very little movement. The frames were fairly rigid but there was enough flex at either end to necessitate the best handling bikes being fitted with rock hard shock absorbers that would probably contravene the Trades Description Act if sold today. A fast bike in the mid eighties was generally very harsh and didn't work very well on bumpy roads. It would also be incredibly slow steering to make up for the inherent deficiencies of the suspension and tyres. But a good racebike, on the other hand, needed to work on all sorts of surfaces. The ride wouldn't be plush by any means but the suspension would be very well controlled and would take up a lot of bumps because otherwise the bike wouldn't get its power down properly. The swingarm would be heavily braced, likewise the forks, and the tyres would be far better than road rubber. Finally, the racebike would probably be 15-20% lighter than the road bike. All of which would add together to give you a bike that steered quickly but was reasonably stable, that dealt with the worst of the bumps and that offered the rider an enormous amount of feedback as to what was going on. At the same time you had an engine that developed plenty of power from low down and a slick gearbox, plus a setup that actually worked best overall if you didn't hang off like a gibbon but simply shifted a little weight. Which is pretty close to what the 1000DS gives you. To the extent that I felt instantly and completely at home on it. Swinging a leg over it is easy because although quite wide it is also fairly low, and once in the seat you are rewarded by a view that couldn't be anything other than a Ducati. Two white faced round clocks in a black crackle finish panel with a neat cluster of idiot lights above them. And no redline on the tacho. The bars are a fair reach away but are positioned to fall immediately and comfortably to hand once you adopt "the position." In this case, with the pegs set high enough to provide acres of ground clearance while low enough to avoid cramp, the position is quite a comfortable one and means that you can carry someone other than your osteopath on the pillion seat. Which reminds me. 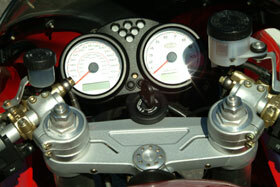 The pillion seat. There is one, and it is actually quite usable. 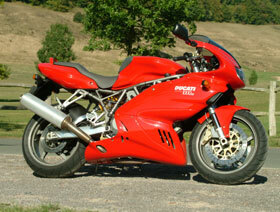 For some odd reason, people always seem to complain about Ducati mirrors. I have two issues with this. First of all, if you want fantastic rear view mirrors you don't buy a committed sportsbike because they just don't have them. 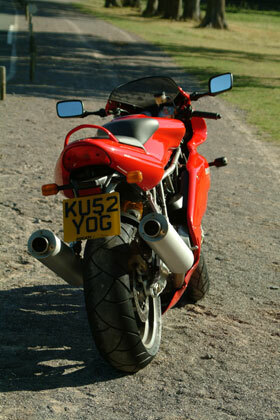 And secondly, I've never had a problem getting an adequate rear view on a Ducati. But the DS should satisfy the critics anyway, because the mirrors, although they look like something of an afterthought, are brilliant. The lights are fine as well, with the single big headlamp providing a comfortably wide spread of light and a good high beam, though personally I'd still like a second bulb in there because you can't have too much illumination in my view. Finally, while we're talking about practical things, the conventional exhausts mean that yes, there is storage space under the seat. But enough of this practical stuff. This is a road test, and that means riding. Turn the ignition on and press the starter within 15 seconds or the energy saving ECU will turn itself off. A few seconds of the by now expected asthmatic wheezing by the starter motor and the engine catches, issuing a pleasant but rather muted burble from the pipes. Now that's something which has changed a lot from the old racers, which were fitted with Conti "silencers" that actually seemed to amplify the sound... Something else that changed quite a long time ago is that Ducati have abandoned the comedy sidestand in favour of one that you have to raise yourself. So flick the stand up, engage first and pull away. First is very tall indeed, so there's much clutch slipping and mirror shaking until everything settles down, but it's still all very non threatening and comfortable. This is a bike that you can simply get onto and ride. It's as thoroughbred as you could possibly want but seems to have managed to avoid the pitfalls that an impeccable pedigree can sometimes come along with. That's not to say, though, that this bike is a true master of all trades. At very low speeds it gets a little uncomfortable after a short time as the heavyish clutch and the riding position conspire together to make the wrists ache. In town the initial discomfort soon gets added to by the heat coming up from a power plant which, deprived of a cooling airflow, soon starts to do a reasonable impression of an Aga. Great in the winter I'm sure but as we tested the bike at the end of a very warm summer it became a trifle sweaty. And there is one other little gotcha for town riding as well. The steering lock. You want to do a U-turn? Well, unless you're doing it on the M4 it's going to be tight. But let's be honest here. If you want a Ducati to ride in town you buy a Monster or a Multistrada, not a SuperSport. And once we take the 1000DS out of the city and drop it back in where it belongs the story becomes a far happier one. On the open road the 1000DS continues to give the same impression that it does when you first get on. It is comfortable, relaxed, smooth. It fits like a well made suit, and although the steering isn't in the "think of a line and it takes it" class, it is easy to turn and holds a line beautifully, regardless of road surface. But it really isn't very fast. At least it isn't until you glance at the speedo. Hmm, so that's why that bend seemed a little tighter than usual, then. Make no mistake. 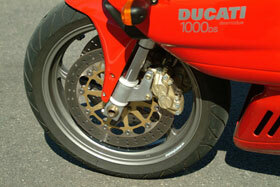 The Ducati 1000DS may seem like a gentle giant, it may be subtle, relaxed, refined even. But it is a bloody fast motorbike. It doesn't so much accelerate as just gain speed. That doesn't make much sense, I know, but when you open the throttle, especially out of a bend, you don't get that slightly disconcerting feeling of an awful lot of power going through a tiny little contact patch and you don't get the immense bang of acceleration that a lot of sportsbikes deliver. There is no big drama at all, in fact. The engine just makes a nicer noise and the horizon sort of gets closer. You never feel as though you are going especially fast, although you are in fact going at least as quickly as you would normally. But here's the real magic. You aren't trying at all. Neither is the bike. You are going as quickly as you could reasonably want but you are completely relaxed and well within your limits. While we are talking about making brisk progress, it's probably worth mentioning handling. I've been wracking my brains since I got off the bike trying to think of the right word to describe the handling of this bike. And the best I can come up with is this. Fantastic. You may be able to do better linguistically but you'll be very hard pushed to find a bike with better real world handling then the 1000DS. It's all part of the overall package, I think. A soft power delivery with an extremely rigid frame and very high quality suspension, courtesy of Ohlins at the back, make for a bike that simply does exactly what you ask of it, when you ask it. But it does it with such great dollops of spirit that there is no way this bike could ever be accused of being clinical or over-efficient in the way that some other equally capable machines are. One more thing on handling. The 1000DS is perfectly happy to go round corners with your knees and elbows scraping the ground like Reuben Xaus or tucked in and tidy like Geoff Duke. It seems to make no difference to your speed, at least on the road, whether you hang off or not. If anything, to me at least, a bike like this actually looks better if you aren't completely hanging off it but have just shifted your weight enough to look as though you mean business. I've already mentioned that Ducati have spent some money on the suspension. It's probably also worth mentioning the brakes, which are sublime. Classic gold Brembo calipers at both ends with standard braided hoses offer brilliant retardation with enough feel that you would have to try very hard indeed to lock it up accidentally. The back brake is slightly more of a brake than usual but still doesn't really do a great deal. So no change there, then, but not exactly a problem either. The brakes, by the way, are mounted on lightweight cast alloy rims courtesy of Marchesini. More seriously good quality kit. I'm in danger of losing my legendary journalistic objectivity here. So I'd better sum up quickly and move on to something else. I loved this bike. It pressed all the right buttons for me emotionally as well as providing a deeply rewarding riding experience. I found nothing I didn't like about it, very little I would change if I owned one and lots of things I liked a lot. Many people said how nice it looked and lots of other bikers expressed surprise at how well it went. And it is staggeringly good value for money. Retailing at just £7250, the 1000DS is comparable in price to any faceless, anodyne multi cylinder middleweight you might care to pick. I know which one I'd go for, every time. Got something to say about this? Make your comments here! Not sure how it works or what this is all about? Fair enough - you can find out all about it here.